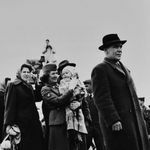 The Vera and Donald Blinken Open Society Archives launched its new website on the 1956 Hungarian refugees in the United States with the generous support of the Blinken family. The website contains still unexplored or lesser known material (text documents and photographs) from the archive of the International Rescue Committee at the Hoover Institution and the relevant collections of the National Archives and Records Administration of the US. The Blinken OSA is now making these recently revealed and digitized records available online for scholars and the wider public in both Hungarian and English.